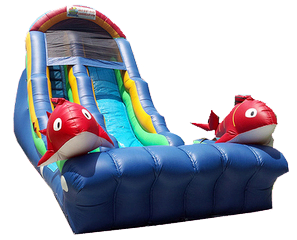 This 18ft Fish Dry/Wet Slide is perfect for your ocean lovers. Front load climbing to a 18ft tall water slide. Two big colorful fish on each corner. This can be used wet or dry. Recommend 3 kids at a time, one sliding, one climbing and one entering. This unit must be staked or tied off for safety, otherwise water barrels must be ordered.